Bayern, champions for the past six seasons, are one point above Borussia Dortmund with five games to go. Coman's left-wing cross flew straight into the net and he smashed a second into the top corner with Serge Gnabry adding a third from close range. 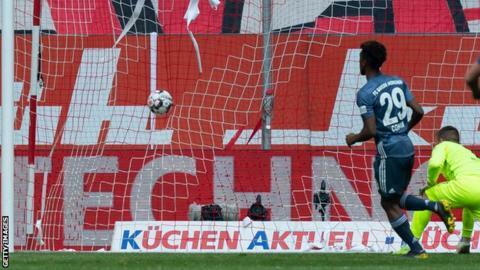 Dodi Lukebakio scored a penalty for Dusseldorf but Leon Goretzka added a fourth for Bayern in injury time. Bayern lost goalkeeper Manuel Neuer to injury early in the second half, with Sven Ulreich replacing him. France winger Coman and Bayern striker Robert Lewandowski had a fist fight during training on Thursday, but neither player was punished. The German champions have won 15 of their past 17 Bundesliga games to overtake Dortmund at the top. Elsewhere, English teenager Reiss Nelson scored a header on his first start of 2019 as Hoffenheim beat Hertha Berlin 2-0.